It's Wednesday. And Wednesday is as good a time as any for some DotA cosplay. 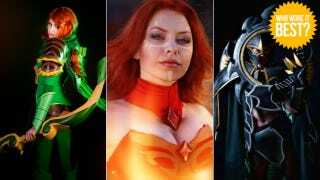 Who doesn't like DotA and Dota 2 cosplay? DotA or Defense of the Ancients was originally a multiplayer mod for Warcraft III: Reign of Chaos and its expansion. Subsequently, other modders added more content to DotA, creating a thriving and ever expanding experience. Since then, IceFrog, one of DotA's early modders, has joined Valve and is working on a sequel called Dota 2. While Dota 2 is a standalone sequel, let's use this opportunity to look back at some, but not all, of the best cosplay for DotA and Dota 2.